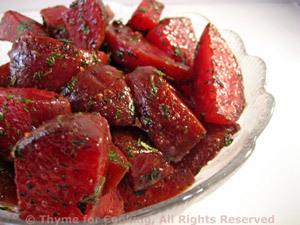 Buttered Beets (Beetroot) with Parsley, Thyme for Cooking easy side dish. A simple preparation: sauté the beats in a bit of butter and finish with parsley, salt and pepper. Be mindful of the beet juices as they stain everything they touch. Melt the butter in a small skillet over medium-low heat. Add the beets and sauté gently until heated through, about 10 minutes. Stir in parsley, and sauté a minute longer.